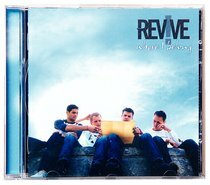 Revive is an Australian Christian pop/rock group which formed in 2004. The band consists of Dave Hanbury (vocals), Tyler Hall (guitar), Rich Thompson (bass) and Mike TenKate (drums). They had success throughout Australia, releasing two albums, as well as supporting Third Day on a national tour in January 2007. The band then relocated to America to pursue their career in Christian music. The band's albums include Where I Belong, Tralgafar Street and Blink.